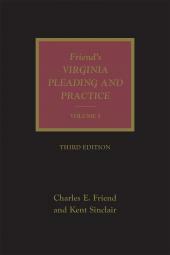 Written by Charles E. Friend of Williamsburg and annually updated and supplemented by Professor Kent Sinclair of the University of Virginia School of Law, leading Virginia civil practice and evidence scholars, Friend's Virginia Pleading and Practice, Second Edition aids the practitioner and judge alike in understanding the law and its application to pleadings and practice. 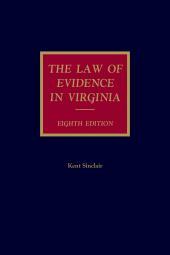 Professor Sinclair is a full professor who has served as Associate Dean at the University of Virginia School Of Law, where he teaches Evidence and Procedure. Professor Sinclair served as a United States Magistrate Judge for seven years and has taught at Virginia for the past 30 years. 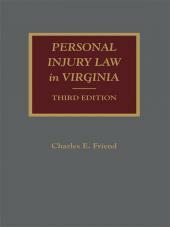 He is reporter of decisions for the Supreme Court of Virginia, chair of the Advisory Committee on Rules of Court for the Commonwealth, reporter for the Boyd-Graves Conference Evidence Project, and a frequent lecturer on Virginia practice & procedure and the law of evidence to judges’ groups and lawyer CLE programs. He has served as an expert commentator for the LexisNexis legal research service, and is co-author of Sinclair & Middleditch, Virginia Civil Procedure, Friend & Sinclair, Virginia Pleading & Practice, and several other books. 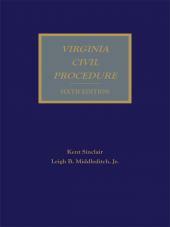 Professor Sinclair is editor and reporter for the four-volume Virginia Model Jury Instructions. Chapter 7 Commencement of Actions: Complaints, Etc.